Maxine DalBen » Man Evolves. For some time now, I had represented our collection of art produced by Maxine DalBen on the Edwards/Pedersen Collection page. For purposes of continuity, I have decided to place all of her works on to this her own page. Until recently, I was aware of only one other painting sold at auction, a landscape titled Quartz Mountain Road. The road is locate more or less east of Amador City in California. Maxine lived there for a while and painted in a studio up on Church Street. Today, Quartz Mountain Road runs through an area with house so large and pretentious that they must all have been bought by lottery winners, judging from the images that show up when I Googled the name of that street in Google Image. 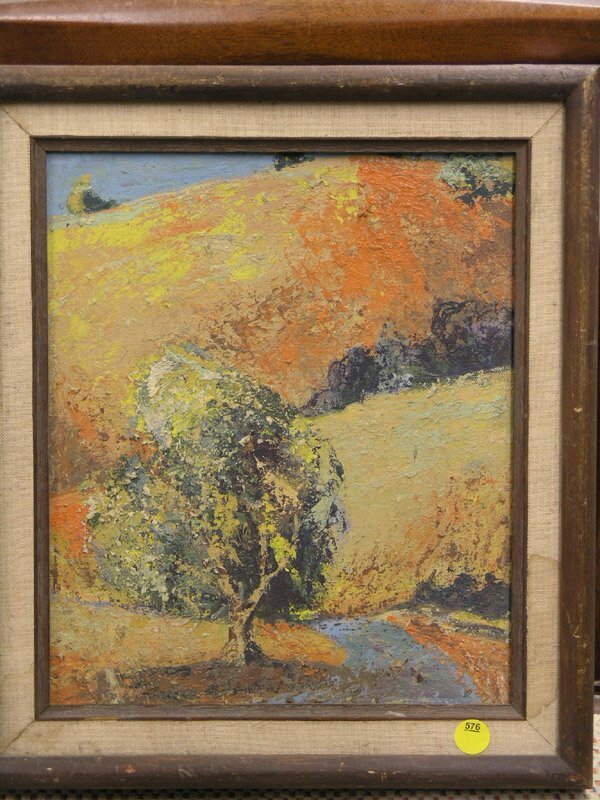 It was sold at auction by Clars Auction Gallery in Oakland, California. This piece must have been painted in the 1970s. 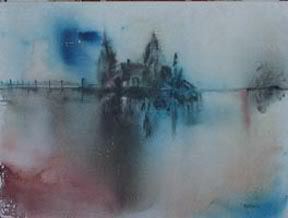 Until recently, that is the only painting for which I had an image, apart from those that we own. 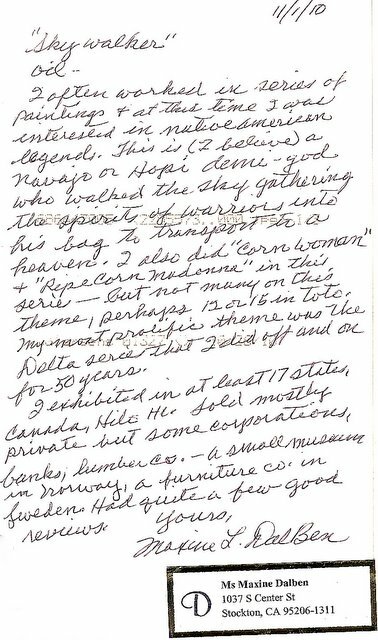 I received an email in early February of 2012, from someone who had purchased an early work of hers. He send an image of it to me. 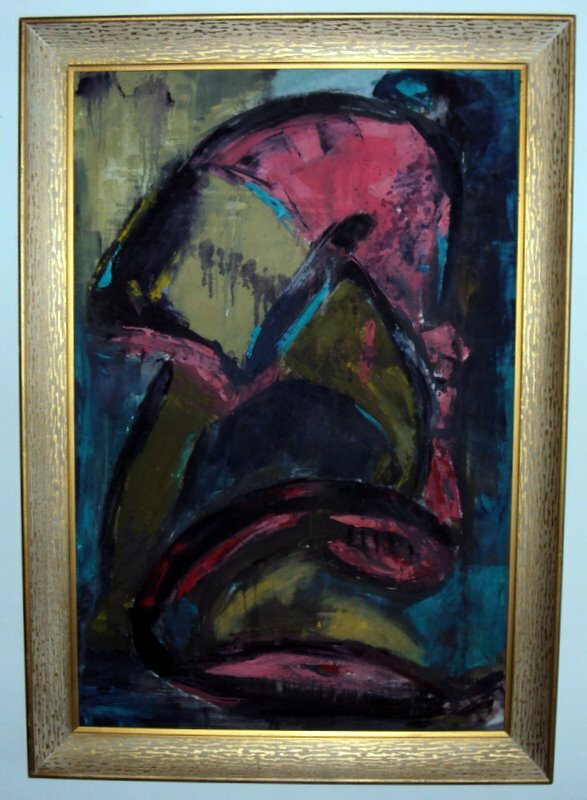 As of August 27, 2013, a painting done in 1965 has emerged. This oil painting is a part of the Delta Series and is titled “Tule and Fields, Lower Jones Tract”. The dimensions are 24″ by 48″. 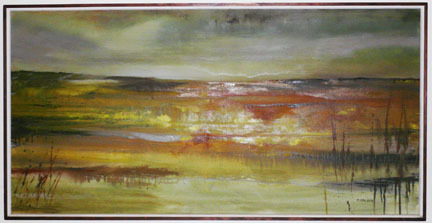 The Edwards-Pedersen collection of Maxine’s work begins with another representation of the Delta. In the winter of 1955/1956 there was a horrendous flood in the Sacramento Valley. Folsom Dam, on the American River, had been completed, and was rather quickly filled to the brim. In those days, the City of Sacramento was bordered on the north by the American River, and on the West by the Sacramento River, to which the American River is a major tributary. Upstream from the confluence of those two rivers was another confluence at which the waters of the Feather River entered, and added its bulk to, the Sacramento River. The Oroville Dam, on the Feather River, had not yet been constructed in those days. During this particularly inclement season, the Feather River breached its earthen levies flooding portions of Marysville and Yuba City before adding to the volume of the Sacramento River. The Sacramento River, already swollen by the contributions of the Feather, made it more difficult for the American to empty its contents, which caused flooding in areas north and east of the then Sacramento City limits, in areas that were then only occupied by fields growing hops … notably the Horst Tract. This flooding was not due to any breaching of earthen levies, but by simply overflowing their banks. Downstream from these calamitous events there are additional confluences. The Cosumnes River and Mokelumne River add there bulk just south of the City of Sacramento. But then, at a point about fifty miles south of Sacramento, the San J0aquin River attempts to reach the sea through the same channel as the already swollen Sacramento. River. Wheteher by breach of levy or by over-topping their limited height, much of the lowland near Stockton were inundated. Recorded here, in a painting by Maxine DalBen, is a farm house, set wisely on high ground, is surrounded by flood waters. The technique involved in making this piece that an image of the farmhouse was built up in impasto on a hard surface, then a canvas stained with misty background colors was pressed against the hard, impasto-ed surface to transfer that image on to the canvas. There are in existence a number of much larger works in the Delta Series. To date, no one has brought them to my attention. beautiful painting “Sky Walker”… a true artist Ms.Dalben. do you have more photos of her work? like the ones your gallery owns? Sadly, no one, other than you, has offered any pictures for me to post. Pictures of your own works, I presume. Please do so. Send them to alan6401@hotmail.com . Have you seen the Slantstep show at the Nelson? If you have a digital image of the painting that you could email to me, I could try a guess at its value. I would need to know the size as well. You can send it to me at alan6401@hotmail.com.